The nature of refurbishment and repair is markedly different from new-build work since it is necessary to work within the restraints of a pre-determined situation. Those who do so are faced with an existing building or structure that may be many years old. It may have been built to standards hardly recognisable when compared to those of today. It is therefore necessary to build safely and to match as closely as possible comtemporary standards on sustainability and energy conservation. It is also apparent that existing buildings may not conform to 21st century standards of structural analysis or stability - and yet have stood without distress for many years. Guidance is provided to deal with such situations together with ideas on how to assess the residual life of a refurbished or repaired building. 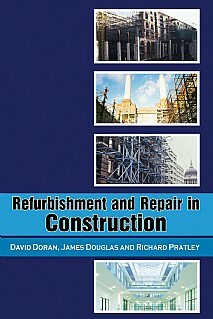 This book proceeds logically through the reasons to consider refurbishment and repair and offers advice on risks, discovery, contracts, materials, learning from the past and legal restraints. Best practice is illustrated by a series of case studies. Extensive bibliographies have been provided to assist those with the need for further research. Refurbishment and Repair in Construction provides a companion volume to Site Engineers Manual which will be available as a second edition. This practical handbook will be of immense value to practitioners, construction professionals, architects, engineers, contractors, surveyors, lecturers and students in these disciplines.